Did I ever mention I have the biggest sweet tooth in the world, and absolutely zero willpower when it comes to it? Yup that's me! And I'm convinced if I didn't love making healthy recipes for not so healthy classics - I definitely would not be the healthiest me. As I mentioned in my last post, that's a major reason I started blogging and recipe developing in the first place. I did not want to live a life without dessert! It sounds dramatic, but I know some of you can relate! (hopefully) For me, a small treat at night just tops the day off and brings a little happiness and comfort after a long day. It's also a reward for getting up every morning to live active, healthy, and happy life day after day. Because we all deserve a little something for that. I wanted my next ball or bites recipe to be super simple, with minimal ingredients that everyone can find at their local grocery. Don't get me wrong, I love adding as many superfoods as possible, but that isn't always realistic or doable for everyone. As I was grocery shopping last week, and walking down the most dangerous isle possible (cereal isle), I came across Kashi's new organic sprouted grain cereal. I was a a bit shocked to read how great the ingredients were AND that one serving was around 1 and 1/4 cups! That was a lot of cereal for such great stats! I knew I had to do something with this gem. * Because this recipe should be accessible for everyone, if you can't find Kashi's sprouted cereal, there is another way to make this recipe "sprout friendly." 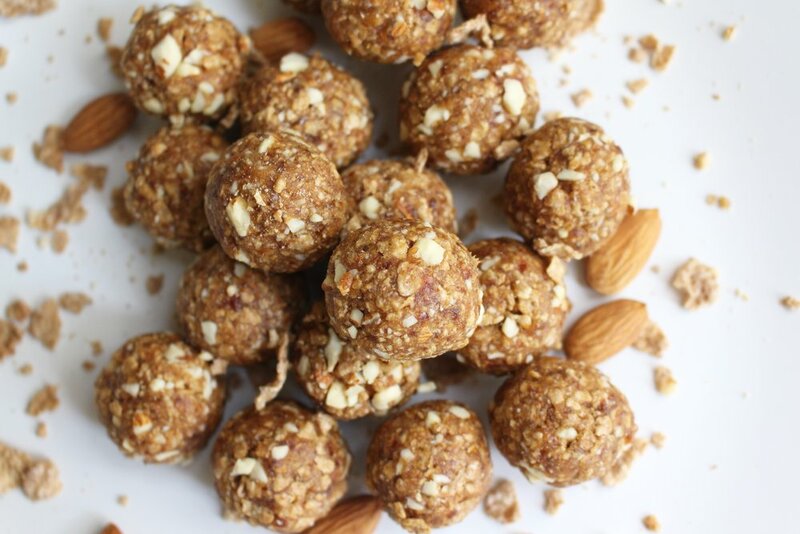 The second ingredient of this recipe is almonds, and by just soaking your almonds for a minimum of eight hours, your almonds will be much easier to digest and easier for your body to absorb nutrients. If you want to learn more about sprouted grains and why they are so good for you, check out this post! Let's get into the recipe, I hope you love it as much as we do! If you decide to soak your almonds, just place them in a large bowl of water and cover with a light cloth for a minimum of 8 hours. After 8 hours, drain water and pat dry almond before adding them to your food processor. Next, add your pitted dates and cereal. Pulse on high until completely combined and pearl or bead like granules form. 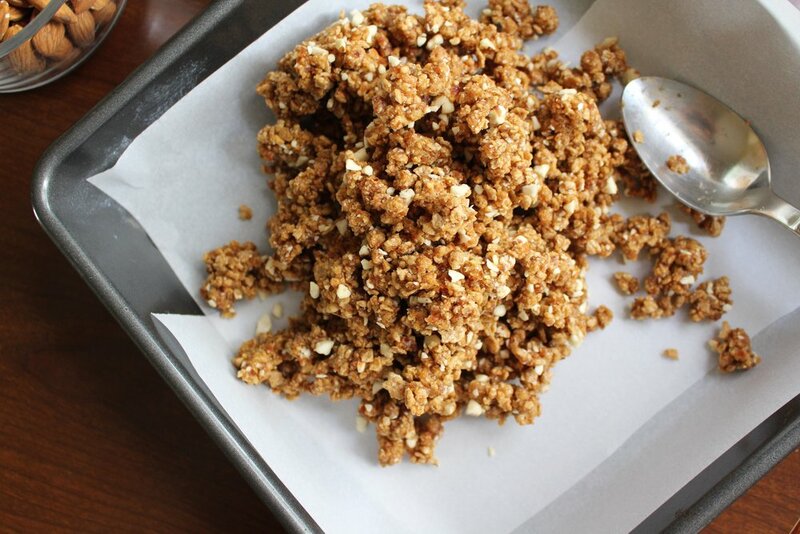 Transfer the mixture into a bowl and prepare a baking dish or sheet with parchment paper. Roll the dough into 1" balls, this recipe makes roughly 18 balls. Refrigeration is optional for this recipe, as they will keep longer if they make it past a few days in your kitchen! Ours surely did not!